I love the sound of that, and I think I do try to live as fully as I can. But I am also aware of how easy it is to get stuck in the same patterns of being and behaving. So today, I tried a little experiment–maybe not quite the Grand Adventure, but a little adventurous detour from my familiar paths. Every workday, after dropping off my son and his two classmates, I head down the road, make a left, then a right, drive about two miles, and then get on the highway to head to work. This morning, though, I made a left, then a right, drove about two miles… and then kept going straight. Sure, I was vaguely aware of where I was going. I needed to head north, and I was heading north. I needed to cross the Chattahoochee, and eventually the road would dead-end into another road that led across the river. But I had never gone this way to work before. In fact, I am not sure I had ever really explored this part of the city. Eventually, though, I came up on a turn for Paper Mill Rd., which seemed to be the turn I would have to make if I was going to get to work this morning. I followed the road–absolutely certain I had never been on it before. It was a very pretty drive. 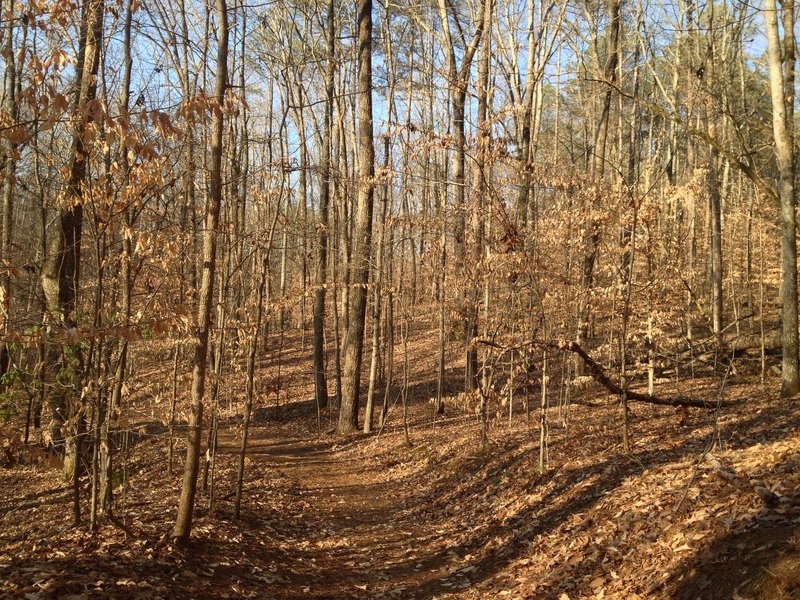 Then I saw the sign for the Sope Creek Trails. I remembered hearing mention of this patch of the Chattahoochee Recreation Area before–maybe–but it was a new location for me. My calendar was empty for the morning, and it was still early, so I decided to pulled in. I took a 20-minute walk through the woods–down a trail, across a small creek, then onto a pond and back to the car. Suddenly, I forgot I was in the city–or rather, I was reminded that the natural world was all around me, all the time. It was a delightful way to start the day–and totally unplanned and unexpected. I experienced a new and beautiful location within my city, and I got to spend 20 minutes in nature before spending the rest of the day at work. As I said, not exactly a Grand Adventure, but the point here is in the attempt to create these moments for chance, experimentation, and novelty within each day–and then to see the day anew. Even if it only means taking a detour from my morning commute and walking in the woods. This entry was posted in Uncategorized and tagged mornings, nature, risk, simple action. Bookmark the permalink. Thank you for reminding me that breaking out of a rut can be a simple as this. True–it’s amazing how a little change can open up an entirely new vista! Every moment in nature is a grand adventure. My soul calls me to start each day like this….now, if I could just figure out how ditch a little problem called work! That’s what’s so great about a 20-minute detour…I was still at work on time, but my entire day had a different sense about it.